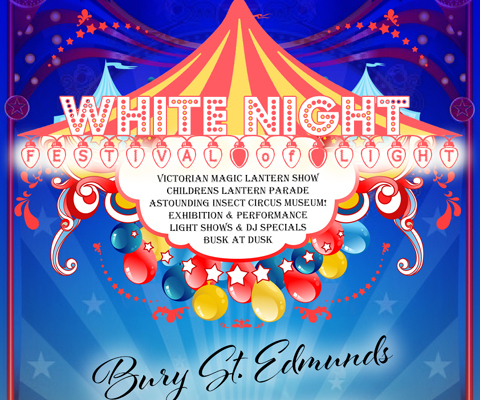 The Arbon Arts Centre CIC presents an exciting new festival – White Night: Festival of Light – for Bury St Edmunds where, for one night only, the town becomes the venue with a carnival atmosphere! This pilot project is planned to become a regular yearly Festival for Bury St Edmunds to showcase the wealth of local creative talent in the town and surrounding areas. A great opportunity to engage the whole community! Most events are free across town with suggested donations. This first event is a fundraiser for the new Arbon Arts Centre community arts space for Bury with all donations being split equally between that and Suffolk Mind. See: https://arbonarts.wordpress.com/events/ for more details.